Winter walks in Cheshire can be even better than at other times of year. Marvel at the gold and copper tones of autumn leaves, enjoy the sparkle of hoar frost on winter stems, crack frozen puddles, or print virgin snow with the first footprints of the day. During the short winter days, it’s refreshing to get outside and feel the sun and wind on your face, or revitalise yourself after long days stuck inside, especially at Christmas or New Year. The Sandstone Trail is perfect for winter walking. There are plenty of clear starting points and parking is easy. 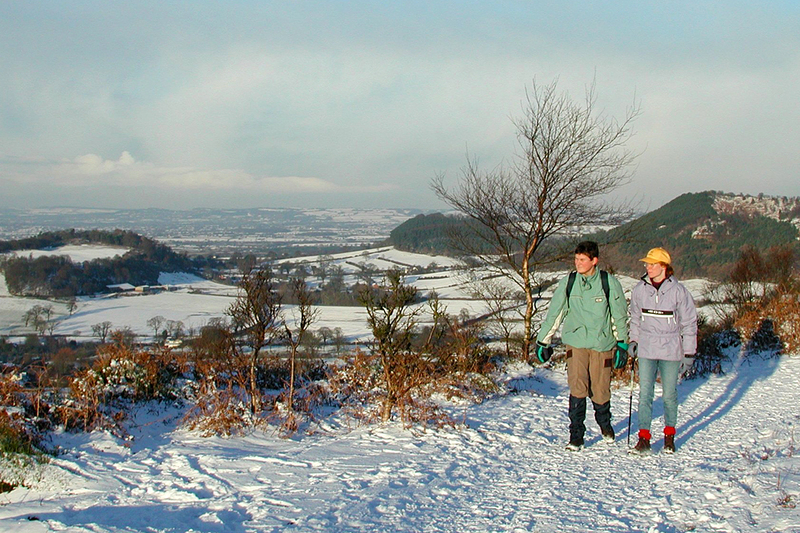 The elevated Trail gives great views over the Cheshire farmland to the Welsh hills, themselves often capped with snow. And, depending on the weather, there are sheltered sections in Delamere Forest, on Bulkeley Hill, or in Hether Wood (near Bickerton), or more open areas with far reaching views, where the transformed winter world is spread out below you. What’s more, the Sandstone Trail is so popular and so well waymarked that even in deep snow or poor visibility, there’s no chance of getting lost. With route finding made so simple, you can just enjoy the walk. And there are some great country pubs along the way with real fires, real beer and fantastic food. Exercise plus relaxation. What more could you want for a winter’s day?